Oupa enjoying a great laugh. Ikhankatha (played by Simo Majola) has come to fetch the Boy. Wiseman tells Joseph about his grandmother who spent her whole life waiting for her lover and husband who never came back. Now Masiza is playing the grandmother. Details of the premier at PopArt. This play is specifically targeting 7-11 year olds. Masiza Mbali (left) now playing Joseph and Simpho Mathenjwa playing Zanemvula. The two actors swap characters. Theatre Arts Admin Collective, from 30th June until 4th July 2015. Joseph and Wiseman playing a game. The silent wage is whoever wins will tell the other the truth behind their motives; a grandson looking for his lost grandfather and a man living with his grandfather’s ID. What really happened to the real grandfather? John is on the phone with his daughter in law and grandson. He is happy to hear the grandson is following in his footsteps and his fathers – their shared love for soccer. Wiseman telling Joseph his reasons for looking after a dead ‘ghost’ which haunts him every night. Masiza Mbali, Joseph Langa after he was just accused of stealing the ID of Wiseman’s grandfather. Jacques is joined by Oupa Ledwaba, the son, and he puts on the white wedding dress to dance with his father. The dress is the symbol of love and John’s longing for his late wife. They are playing a board game – we invented a hybrid between chess and checkers. Wiseman having a nightmare – his grandfather calls him in his dreams. 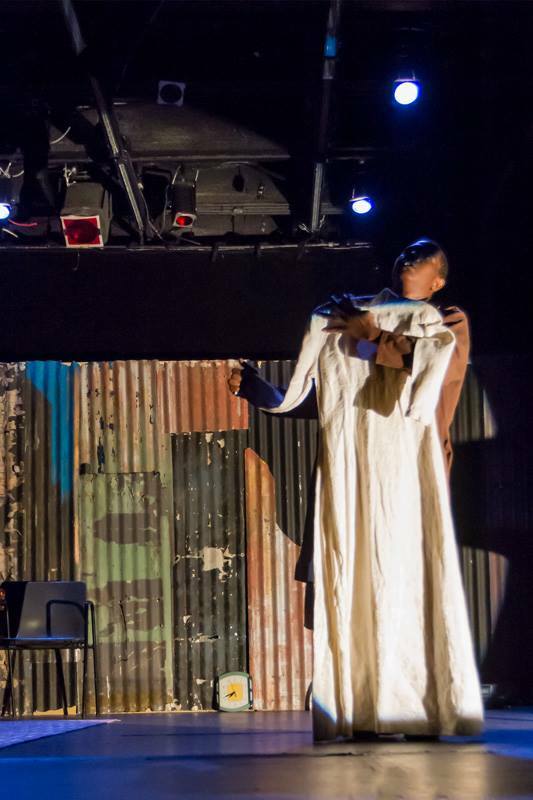 The boy, (played by Omogolo and Vusi, his lover, (played by Lebohang) make a promise to each other.